One of the undesirable outcomes of building DIY projects is the excess of some building materials that were used. 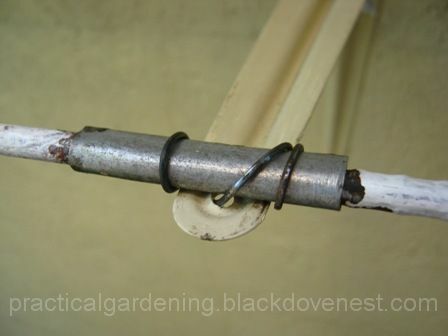 Such is the case with the recent projects on a wall-mounted garden nursery rack and a homemade rod assembly for hanging baskets. As the racks and rods were measured and cut to custom-fit an existing wall, bits of hardware with odd measurements were left. 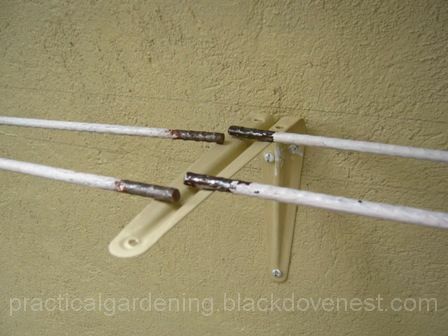 Rather than throw or dump these somewhere, they were put into better use by joining them together for additional garden racks and hanging rod assemblies. Since this gardener doesn't have access to welding tools or facilities, an option left was to creatively join the leftover materials without compromising too much the structural and functional integrity of the new gardening projects. Leftover rebars or rods may be connected by joining their ends together. 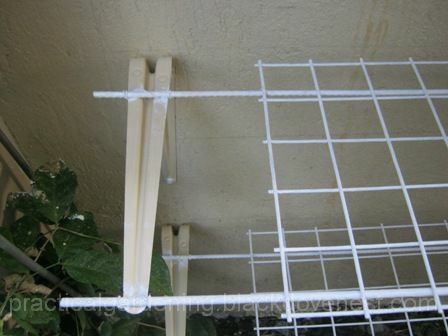 The trick to effectively connecting the 2 rebars in the rack or in the rod assembly is to join the rebars' ends at the brackets. The force that will be applied on the rebars is mainly coming from the weight of the plants in pots or hanging baskets. So essentially, the pressure is downwards. The solution is to concentrate the pressure points on the brackets which can support the combined weight. 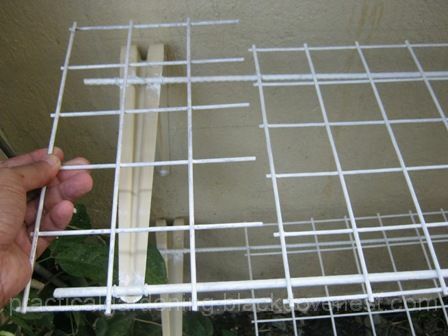 Upward forces are not a problem because metal wires tie down the rebars to the brackets. Lateral forces, on the other hand, can be withstood by joining the ends of the rebars with couplings. The couplings, positioned on the brackets, provides a strong bond for the rebar connection. Cut rebars - 2 pcs. Mounted bracket - 1 pc. 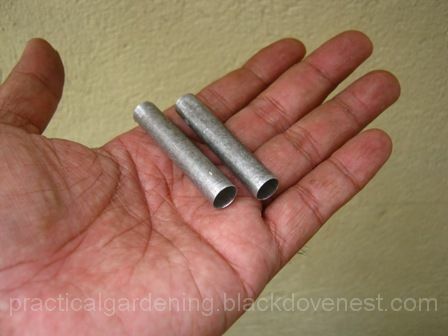 Aluminum tubes - 2" long, 2 pcs. Ensure the ends of the cut rebars meet at the point where the bracket is mounted as shown below. 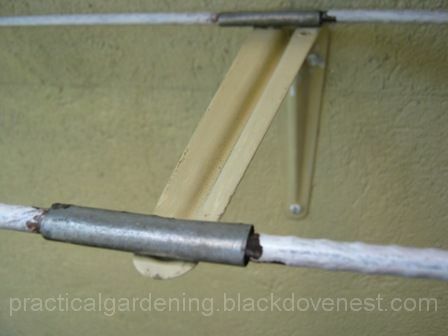 With a hacksaw, cut a couple of aluminum tubes, 2 inches long, from an old outdoor antenna element. These 2 pieces will become the couplings for the rebars. If the coupling's diameter is much bigger than the rebar, flatten the coupling using a pair of pliers. 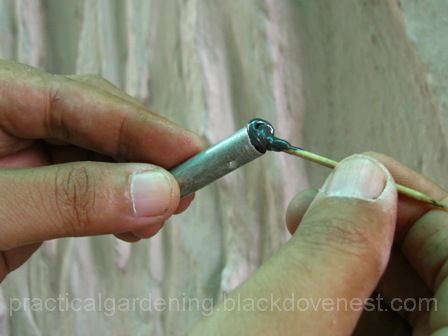 Mix the A and B components of metal epoxy with a toothpick. Push and insert the epoxy inside the coupling. Insert the ends of the rebars in the coupling. Be sure the 2 ends meet halfway inside the coupling. Because the coupling is 2" long, each rebar will take 1" space inside the coupling. Wipe off the excess metal epoxy with a rag. Ensure the coupling lies flat on top of the bracket. Do not disturb the rebars until the metal epoxy has cured and dried. 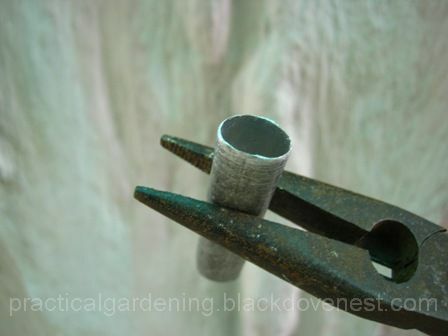 Pass a piece of metal wire inside the bracket's hole(s) and with a pair of pliers, wind the metal wire to the coupling. This will tie down the bonded rebars to the bracket. Joining steel matting on the garden rack is fairly straightforward. Since it basically depends on the integrity of the rebars underneath it for support, the steel matting really just provides the surface for items that will be placed on it. It is made of material that's quite strong and sturdy. The only real issues are: it lays flat, provides a reasonable fit, and is tied securely to the rebars. Determine the correct measurements of the gap or space that will be patched with steel matting. Prepare the steel matting piece to patch the area. Ensure it provides a near perfect match to the gap with no overlaps to the existing steel matting already in place. If the pieces overlap, then the surface is no longer flat. 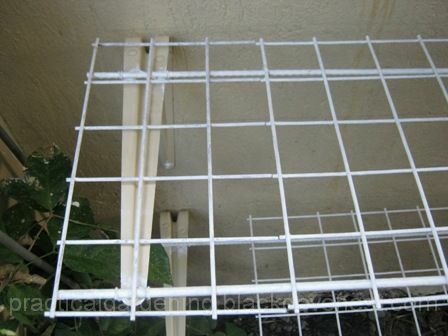 Position the steel matting patch and tie it down to the rebars with metal wire. Ensure that it's flat, secure and has a near perfect fit. 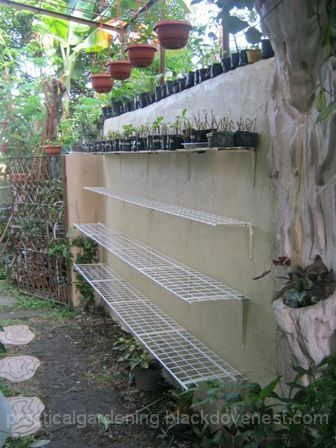 By being resourceful, and with careful planning, a new garden nursery rack may be assembled with just excess material from previous garden projects.